Did Disney Get It Right? Should You Try to Read It in French? This is Join Us in France Episode 181. Join Us in France is the podcast for where we talk about France, its many quirks, its history, its language, and of course, destinations in France you want to learn about because, hopefully, you’ll be visiting soon! Bonjour, I’m Annie Sargent and on today’s episode I’m going to tell you about the Hunchback of Notre Dame, the novel by Victor Hugo. Whenever I am at Notre Dame I like to imagine Quasimodo climbing the facade of the Cathedral, Esmeralda dancing on the esplanade, the gargoyles singing, and Frollo being evil. 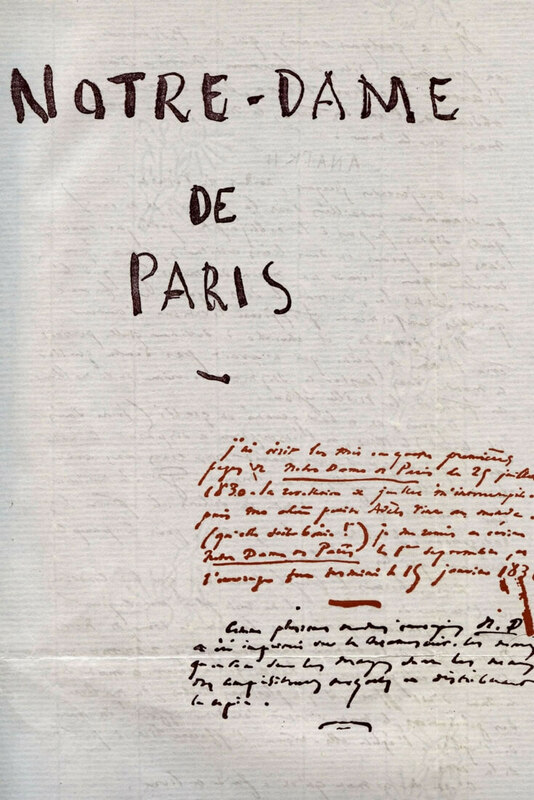 Original hand-written cover page for the novel manuscript by Victor Hugo. But, of course, that’s not quite the story Victor Hugo told. The story has been re-told many times, most notably in a Disney movie in 1996. If you remember the story at all, that’s probably the one that stuck in your mind, and it wasn’t particularly faithful to Victor Hugo’s story. It’s still a good movie of its own right, visually stunning, the music is great, but if you’re preparing a trip to France, I think you’ll be glad you know about the original story because it reveals a lot about French society and how it worked in the late Middle Ages when the story takes place. [01:50] Many tour guides will tell you that Victor Hugo single-handedly saved Notre Dame Cathedral from a sure destruction. While I think that might be a slight exaggeration, the uncomfortable truth is that Notre Dame was in terrible disrepair after the French Revolution. [02:13] The Revolution was hard on all religious buildings, and in particular convents and monasteries. Groups of nuns and monks were threatened, many of them killed, their orders disbanded. The buildings were turned over to military groups or even opened for everyone and anyone to take over. [02:35] The novel The Hunchback of Notre Dame was first published in 1831. When the novel came out, most of the critics loved it. There were a few curmudgeons who didn’t like it (I’m looking at you Balzac!) but readers loved historical fiction, and it became necessary to do a second edition within a few months of the first one. The novel is set in the late 1400s right there in Paris, a place that was familiar to readers, and yet taking on almost magical capabilities. [03:14] What a popular great book can do is turn people’s attention to a topic they had been ignoring thus far. The people of Paris around 1830 knew that Notre Dame was in shambles because they could see it. They knew that during the Revolution the Cathedral was looted and that the people of Paris not only stole everything they could, but they used what they stole to put on plays to make fun of religion on the public square. [03:45] Notre Dame was renamed the Temple of Reason and they forced clergy to perform secular rituals that were based on church rituals, just making fun of belief. It was so extreme that Robespierre himself wanted to put an end to it eventually and declared that the people had to have freedom of religion. [04:08] Two of the stranger things that happened at Notre Dame were that it was used as a wine storage facility and as a saltpeter factory. What’s a saltpeter factory, you ask? Saltpeter is a crucial ingredient to make canon powder, and the Revolutionaries were leading both a civil war and a war against other European powers, so they needed plenty of saltpeter. To give you the 10 seconds summary, saltpeter is scraped off wet, bad plaster walls. Humid basements have saltpeter. They asked people to scrape the stuff off their cellars and bring it to Notre Dame where it could be allowed to dry and packaged to be used in the war effort. [05:00] The people could see the broken statues. They could see that the roof was deteriorating, that the stained-glass windows were broken, that the floors were torn up. 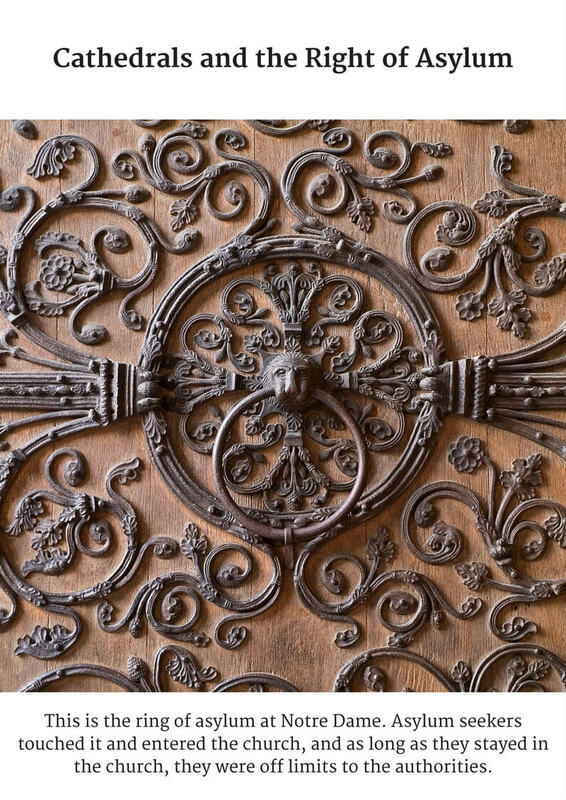 Things turned around for the Cathedral in 1802 when the keys were given back to the custodian of the building and he was able to control comings and goings. Repairs happened slowly. But people didn’t come to the rescue of Notre Dame en masse until the novel woke enough people up to the urgency and the need to reclaim the church as part of our heritage and make it whole again. But eventually they got there thankfully. [05:41] Now, let me tell you about the novel and why it why it was so popular. Victor Hugo was a literary genius, to me, on the same level as Charles Dickens. They were contemporaries: both born early 1800s. Victor Hugo died at age 83 whereas Dickens died of a stroke at age 58. They both wrote during the romantic period and both wrote within the same genre: historical fiction. They both wrote about poor people and the human condition. [06:22] To me, the biggest difference between Hugo and Dickens is that Hugo drives his plots with character flaws instead of events that happen in the world. For example, Victor Hugo put in play a judge who happens to be deaf and desperate to hide that fact. Then, by a whole series of comical misunderstandings, that I’ll get back to in a minute, due to being deaf and in denial, that leads to Esmeralda being condemned to death for a crime she didn’t commit. So at first you laugh about the deaf judge who is such a fool, and then you realize in horror where that’s going to lead. [07:10] Hugo also writes counter-intuitive thieves that are obsessed with following arbitrary rules that they set between themselves. That also leads to funny situations, but the thieves are often more moral than the judges. [07:30] It seems to me that Dickens writes judges that behave like judges and thieves that behave like thieves. What drives the plot with Dickens is that there are events that happen outside of the protagonist’s control, plot are things that happen outside of the protagonist’s control, but people behave more or less according to their rank and place in society. Hugo didn’t follow that convention, and that’s how he surprised a lot of average readers who got a good laugh every few pages. [08:04] But I have to face up to the fact that years ago I tried to read the complete edition in paperback and I gave up. I can’t remember why I gave up, but the size of the thing alone probably scared me (733 pages). [08:24] So this time I went for the abridged version on Audible, an audio book, and I got it in French because French is my native tongue and I enjoy works in the original language better, anyway. The French abridged version is read by an actor André Dussollier, it’s a pleasure to listen to. It’s really engaging, I really, really enjoyed the book. [08:48] But if French isn’t your native tongue, should you try it in French? Let’s put it this way, for those of you who are Patreon supporters, if you can understand Lunch-Break French easily without following along with the text, you might do fine with this audio book in French. But it’s advanced French, be warned. It think it’s better to read an abridged version in English than not read it or listen to it at all. [09:16] So, what’s in Notre Dame de Paris? I am now going to tell you the actual original story as Victor Hugo wrote it. I will skip several parts because it’s so long, but I won’t completely change the story like Disney did. So if you know the Disney version called the Hunchback of Notre Dame, you’ll notice big differences. [09:43] If you’re coming to Paris with kids and they know the Disney story, they’ll be glad to see the actual Cathedral where most of the movie takes place. And you should take them up the tower where Quasimodo spent most of his life. [10:02] I must say that Disney did a good job a rendering Notre Dame visually. The story takes place around 1480 (late Middle Ages) and the stone at Notre Dame was not cleaned up and restored to its original beauty until the middle 1800s, so Disney was correct to show it as a dark gray cathedral. [10:28] When you go today, late afternoon the stone looks creamy yellow, you’ll see it in my pictures, But the people who lived in the 1400s never saw it like that ever! Disney also shows a crowded space in front of the Cathedral which is how it was until the middle of the 1800s. So they got some things right, and they deliberately changed other things. [11:09] But, back to the book. The book opens with the election of the pope of fools. That’s when you meet Quasimodo. Various people are trying to make the ugliest face they can through a contraption that only shows their face. Then Quasimodo appears, and he’s clearly the ugliest thing anybody has ever seen. People are in awe of how ugly he is. A true freak who is clearly freaked out by what’s happening around him. Everybody is stunned when they realize that this is really his face, he wasn’t trying to make faces! [11:54] Later on in the book, In the second part of the book we meet a poet named Gringoire, and a thief called Clopin. Clopin begged from Gringoire that very day and Gringoire refused to give him anything. [12:09] Gringoire is condemned to hang death for being too different from present company. But if one of the women in the room wants him, he’ll go free with his new bride. A fat woman comes up, and she doesn’t want him because he’s not rich enough. An old black woman comes up, and she finds him too skinny. A fine young lady comes up to take a look at him and he begs her to take him, but she’s capricious and says no. Then, just as they were about to hang him, in comes Esmeralda, the gorgeous Gypsy woman who takes pity on him, and says she will marry him. She only marries him to save him, her heart is already taken. But she can’t stand to see a perfectly good man be hung for no reason. [13:07] The third part of the book is a lovely description of Notre Dame Cathedral and a scathing indictment of the renovation work by everybody ever. If parts of the Cathedral were broken, Victor Hugo believed in replacing them with the exact same thing. Actually, that’s very much what the folks who maintain Notre Dame today are doing. But for a long time, architects “improved” Notre Dame by adding this or that and he lists several in the book and Violet-le-Duc did even more. [13:50] I’ll put a link to an old translation of that part for those of you who want to read it. Victor Hugo clearly knew a lot about architecture, about Gothic architecture and Notre Dame in particular. And you know what? Going back to Episode 180 last week when I told you about the Gallery of Kings, Victor Hugo says that the Gallery of Kings represents the Kings of France and not the Kings of Judah! The Revolutionaries were not the only ones who thought that. [14:34] This is also where we learn that Frollo is obsessed with the idea that Cathedrals tell stories in stone and that the book (the printing press and cheaper books were new at the time) would supplant the Cathedral by telling stories in words and not in stone. Architecture was the universal language before the printing press came to be. Alas, Frollo’s prediction has come true. Few people today can read the stories told in stones on Cathedrals. But, thankfully, we have many ways to learn new things that would blow his mind. Frollo is worried about books, what would he have to say about podcasts?! [15:19] Worrying about new technologies is something every generation does. Did you know, for example, that a fundamental tenant of the Druid religion in Brittany, was that knowledge could not be written down? If written down, knowledge could be stolen. So, don’t write, make people memorize everything. [15:47] People who wanted to become druids needed to spend 20 years memorizing things. So, by the time you were old enough to have the knowledge death was near—7 or 8 years growing up, 20 years in school, by the time you were ready to be productive, they would be around 28-30 years old. Is it any wonder that their civilization died out so fast? [16:16] The fourth part of the book is a flash back to the day when Quasimodo was abandoned as a baby and left in the spot inside of Notre Dame Cathedral where that sort of business was conducted. People would come by during Sunday Mass, drop off a baby, and the parishioners knew the baby was free to a good home kind of thing. I listened to a radio interview with a historian who has researched foundling children in Paris and she was fascinating, I will certainly do an episode about foundling children in Paris at some point. [17:01] On the day Quasimodo was abandoned, dozens of people are perusing the new babies, but he gets all the attention because of what he looks like. That part of the book is gripping because the people have never met such a deformed child. He’s not abandoned as a baby, he’s actually an underfed 4-year-old. Some people are frightened at the sight of him, some donate money to feel less heartless for being horrified, but the old widows who normally handle foundling children decide maybe they should make a fire and kill him. The description Victor Hugo gives us is amazing, you really think they’re going to kill this baby! [17:52] But a young priest has been looking over the scene and he announces that he will adopt this child. He is described as austere, already losing his hair and with deep-set eyes. Victor Hugo doesn’t give any hints as to why, the priest takes the child, put him in his robes and walks off without giving any explanation. The priest baptizes his adopted child and names him Quasimodo, a name he makes up. Quasi means almost modo means human or newborn. So he’s either a quasi human or a quasi newborn which he is both, really. [18:24] Then the story jumps 12 years to when Quasimodo is 16 and the bell ringer at Notre Dame. His whole world is within the walls of the Cathedral, which he almost never leaves. Quasimodo is one with the church, he can climb the walls like a lizard almost, the Cathedral is his world and his shell. And because he starts ringing the bells at age 14, he loses his earing by age 16. 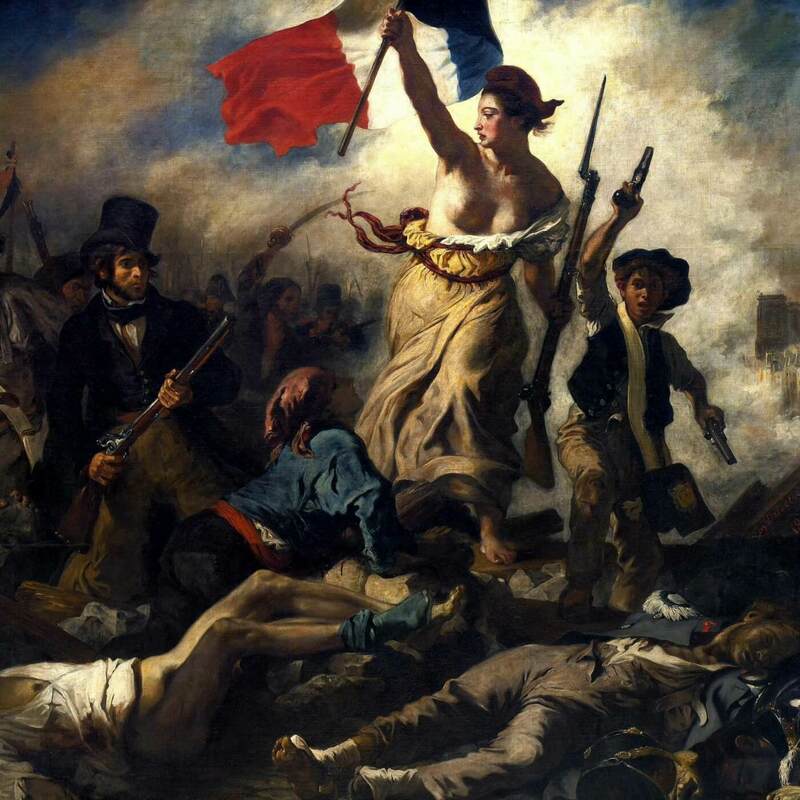 Liberty Leading the People by Delacroix. This piece depicts the July Revolution which took place while Victor Hugo was writing The Hunchback of Notre Dame. [19:16] The hunchback can now only see in one eye, walks funny (and yet is very agile in his familiar environment), becomes deaf, and decides not to speak any more. And is so ugly people recoil at the sight of him. Frollo taught him how to read and write, but he is happiest with the gargoyles and the chimera who look upon him with a favorable eye because he’s monstrous just like they are, but he is alive. [19:48] And this is where the book and the movie defer completely. In book 4, Frollo is portrayed as a kind man and Quasimodo as a mean person. Quasimodo has become mean because he grew up to be almost wild, and the world has been so mean to him. And Quasimodo is strong as a horse which scares people. The only people who don’t make fun of him are the Kings and Saints made of stone that he knows so well. The gargoyles and chimeras don’t scare him because they look like him and he talks to them. [20:27] Quasimodo loves two things above all: his bells and his adoptive father, Claude Frollo. Quasimodo is grateful to his father and hangs on his every word and every wish. Frollo is serious and stern, but treats Quasimodo fairly. [20:49] A new chapter opens with Quasimodo in shackles, brought before a judge for vague accusations that may or may not be real. This is the foolish judge I told you about at the beginning. The judge is almost completely deaf and has spent many years trying to hide that fact. He asks a question, and the defendant answers. The clerk writes the answers even though the judge has no idea what he said, and moves on to the next question. [21:27] But when the deaf judge questions Quasimodo who is also deaf, Quasimodo answers nothing, and the judge doesn’t realize that no words were spoken. At one point the judge asks if the clerk has been able to write down all the answers and everybody in the room bursts out laughing because Quasimodo still hasn’t said anything. [21:52] Quasimodo has no idea what’s happening, and he decides to answer the next question by saying his name when the judge was asking him why he was brought in. More hilarity in the room. Eventually the judge is so angry that he passes a cruel sentence and Quasimodo is going to be whipped. Victor Hugo describes the torture in detail and gives voice to the horrible people who encourage the beating so we’re outraged at how mean people are. [22:27] Esmeralda is the only one who has enough compassion to give tortured Quasimodo some water even though Frollo had sent him to kidnap her before (that attempt had failed) and she recognized him. But she still has pity on him. [22:47] A handsome Captain named Phoebus has a rendez-vous with Esmeralda. Women fall in love with him all the time because he is so handsome. Esmeralda has been totally smitten with him for a long time whereas Phoebus just wants to have fun. He is on his way to the hotel where they are meeting when he realizes he is being followed. [23:15] The man following him is Frollo who is also madly in love with Esmeralda and has sent Quasimodo to kidnap her before (unsuccessfully), and now Frollo bribes the Captain to be able to observe their rendez-vous. Yes, he just wants to look he says and Phoebus, always tight on funds takes the bribe. [23:46] The more the novel progresses, the more we realize just how strange Frollo is. He is a priest, he is supposed to be celibate, we learn how when Frollo was younger other priests would come to him for advice on how to bridle their libido because he was so good at it. Well, Frollo is now pursuing Esmeralda. I suppose he could give up his priesthood and marry her, just be up-front about it, but instead he goes a darker route. He wants her kidnapped, he wants to watch her while on a rendez-vous with another man, Frollo is in full creep mode. [23:30] Esmeralda resists Phoebus at first, she talks about their marriage, but Phoebus says you must not love me if you want me to wait (haven’t we heard that line before ladies, eh?!) and she is about to give in to him when Frollo barges in, stabs Phoebus and then flees. [25:01] Esmeralda faints and wakes up when surrounded by law men. She is brought before a judge and the proceedings are such that Victor Hugo points out all the flaws of the justice system. She is accused of being a foreign witch and Esmeralda admits that she indeed a foreigner. And just like that, she is found guilty and condemned to death. [25:30] This is where we learn about Esmeralda’s despair, her cruel detention circumstances, she is thrown in a damp cellar without a blanket and suffers from delirium and hypothermia. Using his position as a priest, Frollo comes to visit her and at first she doesn’t recognize him. She begs him to take her away from this awful tomb. [25:44] Then he reveals his face, and she recognizes the strange man who has followed her around many times and who stabbed Phoebus. He offers to take her away from this misery and declares his love to her. But she would rather die here than go anywhere with him. She curses him. He is crushed and leaves her in the jail. [26:21] Next day, Esmeralda is led to the small plaza in front of Notre Dame to be presented to the public before she is led to the Place de Grève to be executed. Place de Grève used to be where city hall is today, not far from Notre Dame. This is where for centuries people were brought to be burned alive or tortured to death or whatever other unpleasantness were common back then. Esmeralda is in full despair, she thinks she sees Phoebus at one of the windows. [27:00] Suddenly Quasimodo jumps down on a rope from the Gallery of Kings and swoops to grab Esmeralda. He takes her in the air with him and yells ASILE! Asylum! The crowd cheers him on. Quasimodo can finally show off his skills to everyone. He swings from rope to rope taking her higher and higher on the Cathedral. He is strong, he has Esmeralda in his arms, and the people are astounded by this feat. [27:38] Esmeralda is now under the care of Quasimodo inside of Notre Dame, she has a tiny room with a small window from which she can see the cloister (don’t go looking for the the cloister, it isn’t there any more). Esmeralda is safe there because the authorities have no hold on her thanks to the rules of Asylum. But she still loves Phoebus and refuses to believe that he’s dead. Frollo is also still in love with Esmeralda and he can see her window from his room in the cloister. [28:20] Asylum was an important part of French law and customs between the Middle Ages and Louis XII. The justice system was so fatally flawed and unfair that asylum was seen as a counter balance mechanism. But asylum was also deeply flawed because murderers and the innocent alike took advantage of it. [28:48] Any Royal Palace, Princely Residence or church were places were you could go ask for asylum. 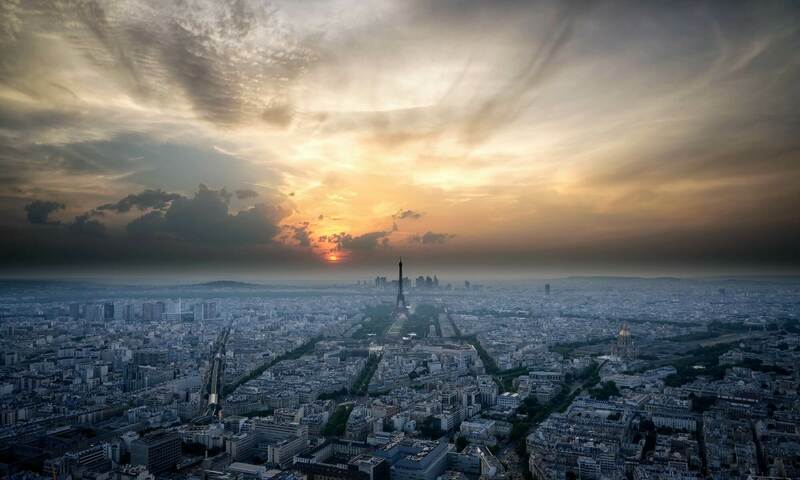 Sometimes, where there was a need to attract new population to a city, the whole city was declared to be an asylum city for a time, Louis XI turned Paris into an Asylum city in 1467. [29:16] Once within the asylum zone, the criminal couldn’t be touched. But as soon as they left, they could be captured to go back into the hands of justice. When you go to Notre Dame, look for the Ring of Asylum on the door where you exit the Cathedral. I’ll put a picture of it on the show notes for this episode. Once you had the Ring of Asylum in hand, you were safe from the law. [29:43] Frollo was going mad. He stopped going out of his room from which he observes Esmeralda. And he saw Quasimodo visit her in her room and how she talked to him. In Frollo’s wild imagination, Esmeralda is in love with Quasimodo and she has somehow betrayed him once more. Remember, he feels like she betrayed him with Phoebus and now with Quasimodo. [30:17] Frollo broke into Esmeralda’s room and again tried to convince her to love him. She refused again. He pressed her and tried to overcome her physically. But Quasimodo gave her a whistle to use to call him, it’s one of the few sounds he can hear. [30:37] When he heard the whistle, Quasimodo rushed to Esmeralda’s room knife in hand and found a man on top of her. As Quasimodo dragged the intruder out of the room, there was more light and he was able to recognize Frollo. Shocked that he almost killed his adoptive father, he gives him the knife and offers his life to Frollo. Esmeralda grabs the knife, is ready to kill Frollo and Frollo runs off swearing that nobody will have Esmeralda. [31:10] Clopin, the King of the Thieves, brought his army of villains to take Notre Dame and remove Esmeralda because he heard that Frollo will go back on his obligation of asylum and will relinquish her to the authorities. Again, the priest isn’t true to his word, but the thieves fulfill their obligation to their sister Esmeralda. [31:36] From the top of the Cathedral, Quasimodo saw what was happening and defended his church by using construction material that were stored on the roof. He threw all sorts of things on the robbers, even melted lead to throw it down upon the robbers. This is where we learn that roof structure at Notre Dame is called the forest that’s still its name today. [32:19] An epic fight ensues that opposes Quasimodo to all the robbers. Quasimodo shines and kills dozens. But eventually the robbers manage to break the door of the Cathedral, enter to rob the place. They came for Esmeralda, but seeing the treasure inside the Cathedral, they get distracted. The King’s soldiers, including Phoebus who we thought dead!, come to chase the robbers away from Notre Dame. [32:52] Quasimodo abandons his fighting post and goes to find Esmeralda. Her room is empty. He searches for her and finds Frollo instead. Frollo is deep in thought and pays no attention to Quasimodo. Then Quasimodo remembers that the only person besides him that has the key needed to get to Esmeralda’s room was Frollo. [33:20] Frollo is looking towards the Place de Greve where a hanging is about to take place. Both Quasimodo and Frollo watch and Quasimodo realizes in horror that Esmeralda is hanging. Frollo burst out in an evil laugh that Quasimodo cannot hear, but he sees it on his face. Quasimodo rushes towards Frollo and pushes him off the tower of Notre Dame. [33:52] Frollo hangs on a long time and father and son exchange a terrible last looks. Frollo clearly wants to live, but Quasimodo, in tears, will not help him. Frollo takes forever to fall, but eventually he does. Frollo’s body bounces off various parts of the church and dies on the ground below. [34:23] Quasimodo disappeared from the Cathedral the day Frollo and Esmeralda died. Esmeralda’s body is taken to an open mass grave. Two years later, when they went looking for the body of a man who the king didn’t think deserved to be left in a mass grave, they find the mostly decayed bodies of Esmeralda and Quasimodo, holding one another, and when they tried to move him away from her, his body fell to dust. I mean, how’s that for a dramatic ending?! [35:07] I am the type of person who can spend a couple of hours inside of a Cathedral and be content looking around at the stained-glass, the candle light, the statuary, try to piece together Bible stories, and wonder what all happened in there over 850 years. [35:30] It wasn’t always so, I remember getting impatient in church as a child. As an adult, I remember walking in a church, thinking this feels unfamiliar and uncomfortable, and walking out immediately. [35:43] But it really doesn’t have to be so. 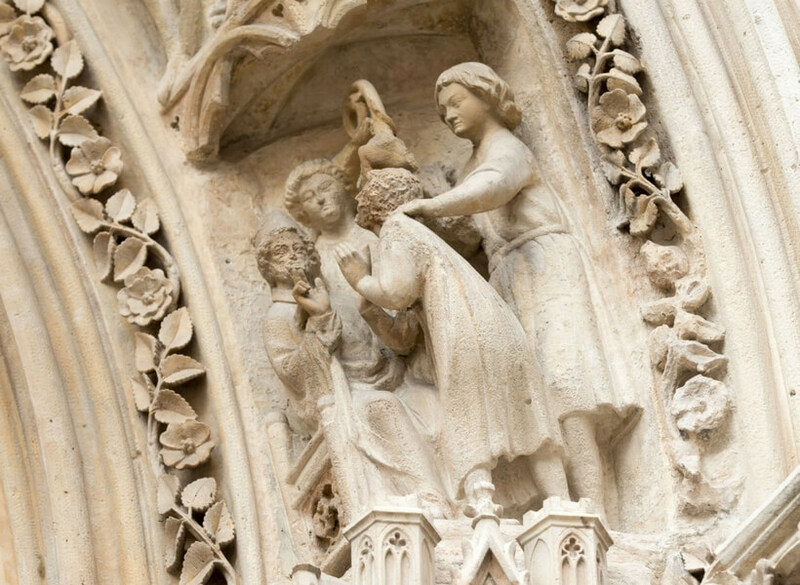 Next time you’re at Notre Dame, think about both the wonderful stories that the Cathedral tells in stone, and also about the wonderful stories that other people have told that take place at Notre Dame, such as the gripping story of the Hunchback of Notre Dame. [36:09] Thank you Colleen Phelan for your pledge to support the show on Patreon this week! A lot of new things are happening for patrons such as yourself, so listen up Patreon supporters, I think you are going to like it! [36:25] Patrons now have access to two rewards per month: Lunch-Break French, that’s the advanced French audio where I write an article in French and English, I read it to you in French first, then I read it in French and English line by line. That’s wonderful for those of you who are learning French and trying to develop your listening comprehension skills. [36:50] And, new starting this month, you also get one installment of the French History Brief where I tell you about one aspect of French history that I’ve researched. That’s in English only. For the month of January I just released one called The Latin Quarter in Paris during the Middle Ages. I explain how it was completely different from the area you can visit today! [37:07] And the third new thing for Patreon supporters is that you now get your own private RSS feed that lets you subscribe to Lunch-Break French and the French History Brief with your podcast app on your phone. Patreon sent instructions on how to do that in your email box, but if you missed it and need help, let me know annie@joinusinfrance.com, it’s easy as pie. [37:39] It’s the same idea as subscribing to any podcast, but it’s a private feed for patrons to say thank you for your support. Once you subscribe to your exclusive Patreon feed, Lunch-Break French and the French History Brief will appear “auto-magically” on your phone or tablet, so you can listen on-demand. [38:02] You get all of this for a donation of $5 a month. And I hope you get great satisfaction when you see that you’re helping the show continue and help you make your next trip to France even better than the last one. Thank you patrons! [38:18] Thank you also to Jessica Bell for Tipping Your Guide. Sending in a one-time tip is also much appreciated. You get value from the show and you want to say thank you? Visit joinusinfrance.com/support to see what you can do to give back. [38:37] Next Week on the Podcast: A short episode on the Axe Historique de Paris. Au revoir, I’ll talk to you next week! [14:35] Next week on the podcast I’ll be telling you another wonderful story that takes place at Notre Dame Cathedral, the story told by Victor Hugo that you know as The Hunchback of Notre Dame. I listened to the book this week and loved it and I can’t wait to tell you all about it. I haven’t seen the Disney movie yet, I’ll do that this week in preparation for the podcast. See, it’s a rough podcaster’s life when you have to watch movies and read books! 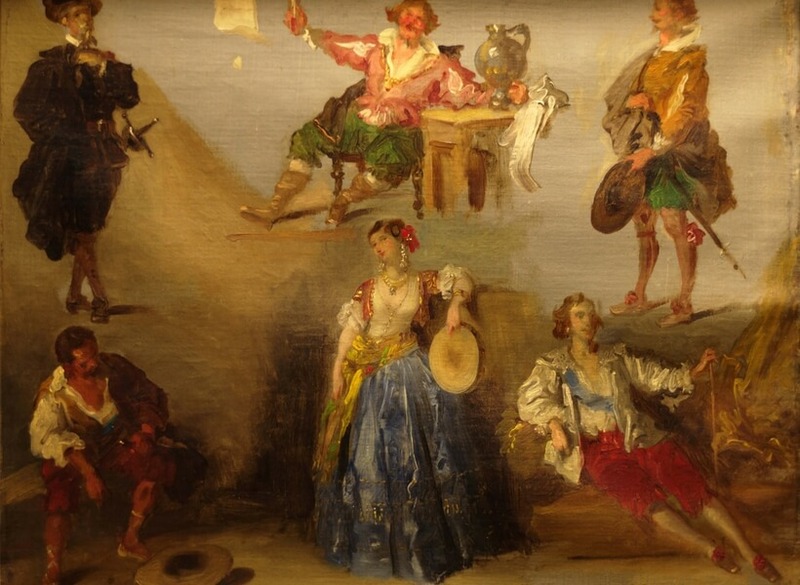 And yes, the gallery of kings, plays into Victor Hugo’s story as well.